When first researching LED lighting, it can be difficult to grasp the language that is used. 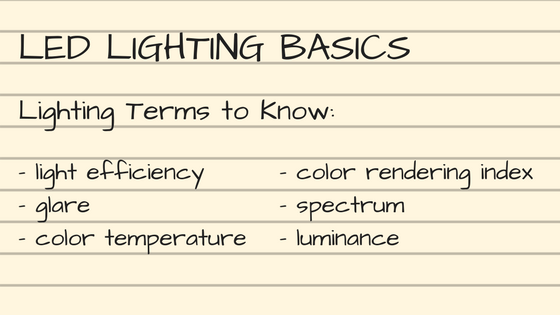 Today, we are taking the time to walk you through some of the basic lighting terms and phrases to help you better understand lighting, and LED lighting in particular! Light efficiency is a way to measure the effectiveness of a light source in regards to what amount of electrical energy is being directly converted into light. The symbol used to describe electrical power is (W) for watts and the symbol for luminous flux is (lm). In comparison to incandescent, fluorescent, halogen and CFLs, LEDs have the highest light efficiency at 120lm/W. We experience glare on a daily basis, whether it is coming from our phones, computer screens or televisions. Glare describes the tiring of the eyes, which then results in blurred or hazy vision and headaches. Glare is broken down into two categories: direct and indirect. Direct glare comes directly from the lighting source. This can happen if the light is not housed properly or is mounted incorrectly. Indirect glares comes from a light source reflecting off of another surface. Glare can be measured with a UGR system indoors or as TI rates outdoors. Every light source gives off a certain light color. This color is represented on a color temperature scale. The color is defined by the spectrum of light from the source and in comparison to an ideal black body radiator. The higher the temperature, the cooler color of light. The lower the temperature, the warmer color of light. The instrument used for measuring color temperature is a luminance camera. Examples of color temperatures and the light they most resemble are listed below. The color rendering index represents how lights show color. The better the light shows color, the better the CRI index. The best rating on the CRI is 100, and sunlight and incandescent bulbs usually rate the full 100. However, daylight is not constant, and incandescent bulbs lose color quality over time. LEDs currently rank as high as 95 on the CRI, and lose less color over time. While the CRI may not be the first thing a person purchasing lights looks for, it should be. Whether you’re a retail store or a restaurant owner, you want your clothing products and food dishes to look their best when in front of customers. Buying light products such as LEDs with a high CRI can help! The spectrum of visible light that we can see ranges from 380nm to 780nm. This plays into the color rendering index (CRI), as the more colors are represented on the spectrum, the higher the CRI score. You can measure the spectrum using a luminance camera. Luminance is an industry word to describe the brightness of a light. Luminance is then measured in candela per square meter, and is measured using a luminance camera. The higher the luminance, the brighter the light! Find the best lighting with Sitler’s! Sitler’s LED Supplies offers great LED lighting products that meet all of your needs. Set up your free walk-through and evaluation today!